When you think American Southern cuisine, you think fried chicken. This is a recipe that is simple in to put together, but complex in flavor with the slow burn of green chilis and smoky essence of paprika in the background. Coupled with a creamy cabbage slaw, you are sure to find new fans with this recipe. Combine the chicken, yogurt, green chilli, Knorr Chicken Stock Powder and sugar together and marinate minimum 8 hours up to overnight. Mix Knorr Batter Mix and black pepper together, divide into two bowls. Strain chicken and reserve marinade. Add reserve marinade to one bowl of Knorr Batter Mix, mix well. Dip in the marinated chicken into the remainder of flour, then into the batter mix and deep fry for 10-12 minutes. Drain excess oil with kitchen towel, serve hot. Dissolved Knorr Lime Seasoning Powder with water. Combine with Best Foods Real Mayonnaise. In a bowl, combine the remaining ingredients, add dressing and mix well. 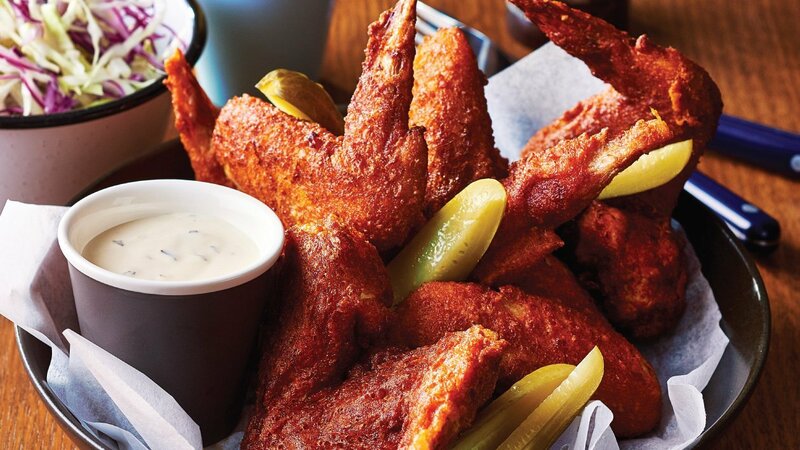 Serve on the side with chicken wings. You can dress your slaw one hour in advance and store in the refrigerator until service. This allows for all those flavours to come together and break down the fibers in the cabbage! This helps the texture and the taste.